Roofing tiles are designed for use as overlapping, water shedding roofing components that rely on the slope of a roof substrate to effectively shed water. Clay tile roofing is a versatile, long-lasting Chicagoland roofing material. Clay tile roofs are highly fire resistant, have a beautiful aesthetic appeal, and have been used in ancient times. Clay tile roofing is one of the most expensive roof systems today. Clay tile is produced by baking molded clay into tile. The density of the clay is determined by the length of time and temperature at which it is heated. Tiles may be glazed and also may have surface texture treatments applied. As a result, there are a wide variety of tile profiles, styles, finishes and colors available. In addition, there may be separate accessory tiles matched to each field tile designs of various shapes designed for use on ridges, hips, hip intersections and gable ends. Installation methods depend on the nature of the tile being installed; that is, whether it is two piece, one piece, interlocking or flat. Their shapes categorize Clay and concrete roof tile: flat or profile. The commons shapes of tiles are, plain tile, pan or cover tile, interlocking tile, and S-tile. There are hundreds of variations in the shape and style of all tiles. 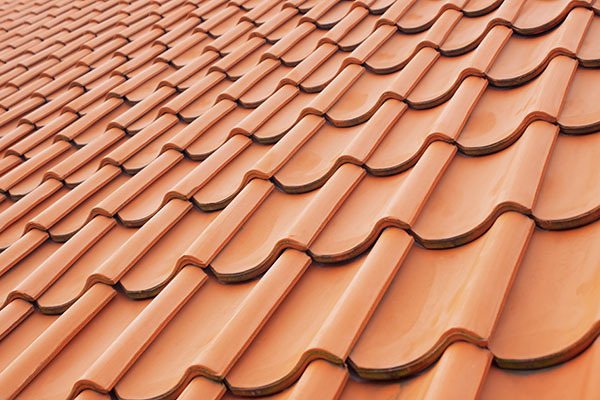 Clay tiles are a heavy roofing system, which does require an appropriate underlying support structure specifications. The slope of your Chicagoland roof should be no less than 4/12 (18 degrees) up to 10:12 (40 degrees). Asphalt saturated, nonperforated organic felts are among the most common underlayments; they commonly are designated as Type 15 and Type 30 or referred to as No. 15 and No. 30, which are reflective of a once used pound per square weight designation. The terms Type I and Type II now used within the roofing industry in lieu of No. 15 or No. 30, respectively. An ice dam protection membrane should be applied starting at a roof’s eaves and extending upslope a minimum of 24 inches from the exterior wall line of a building. For slopes less than 4:12 (18 degrees), NRCA recommends a minimum of 36 inches. Matthews Roofing is licensed, bonded and fully insured.